Are you looking for easy ways to make money from home? Here are some great suggestions. I've been a stay at home mom for over twenty years now. Even though I was an accountant in my previous life – it would be really hard for me to go back to the 9 to 5 grind. The thing is that I got used to having a flexible schedule and being in charge of my own time. So as my kids got older, I started looking for a ways to work from home. I found my answer in blogging. But that is not the only way that you can make money from home. Here are my Top 10. Because it has worked for me – I will put blogging in the number 1 spot. It is really easy to start a blog. You can do it in your spare time and learn as you go. People have this misconception that blogging is just a way of expressing yourself – a kind of glorified hobby. But that is just not true. There are lots of bloggers that are making a full time income through their blogs. Blogging can be a very lucrative business. If you are curious – take this quiz to find out if blogging is right for you. You can also find answers to some of your questions about blogging here. Another way that you can make money from home is by taking online surveys. Typically you can earn Amazon gift cards or gift cards to your favorite online stores. But some survey companies will also pay out via PayPal. The nice thing about taking paid online surveys is that there is really no long term commitment. You just take them in your spare time or whenever you feel like it. The downside is that they do take awhile to complete. Sometimes you also have to take a prequalification survey to see if you actually qualify for the paid survey. Many stay at home moms make money with multi level marketing. If you have a brand or product that you love and talk about all the time anyway – why not make money from home with your efforts? One of the easiest and most overlooked ways to make money from home is to work on saving money. The fact is that we are consumers – which means that we shop. Even the most frugal among us spend money on necessities like groceries, home maintenance, insurance and more. It's pretty easy to just go out and buy what you need – but it is much harder to bargain shop. Activities like using coupons, finding deals, making lists, and creating budgets all take a lot of time. If you set aside a few hours a day to keep your finances in order and to shop smartly, the money that you save on things that you buy anyway is sort of like money that you earn. If you have a teaching or education background you may want to try your hand at online tutoring. Companies like VIPKid and Chegg Tutors hire online tutors. Companies often want to get feedback on their products and services without letting their employees know that they are checking in. So they work with companies like SecretShopper.com to hire regular, ordinary people to go and visit one of their locations and describe their experience. I personally have not tried this – but it is important that you evaluate the company that you choose to work with to make sure it is on the up and up. You can also find side jobs from home by scouring job databases. As a blogger I use a lot of online tools for everything from email marketing to managing my to do list. Each one of these tools is managed by a small company – often a startup. The people that work for these small companies usually work remotely from home. Make a list of all of your favorite online services, go directly to their websites, scroll down to the footer of their homepage, and see if they have a job board or a “we're hiring” option. Even big companies like Apple hire work from home employees. I am kind of partial to this option – since it was one that I did. If you have a knack for organizing you might want to become a professional organizer. You can set your own hours and build your client base at your own pace. Check out the National Association of Productivity and Organizing Professionals website for more information. If you are not quite ready to go out on your own, you can always contact a local professional organizer to see if they need seasonal or part time help. Everyone needs an accountant – it's a fact. If you have a background in accounting and enjoy working with numbers you could become a QuickBooks Pro Advisor. Getting certified is a process – this is how you do it. But once you have the skills, you can work with local small businesses to help keep their finances in order. 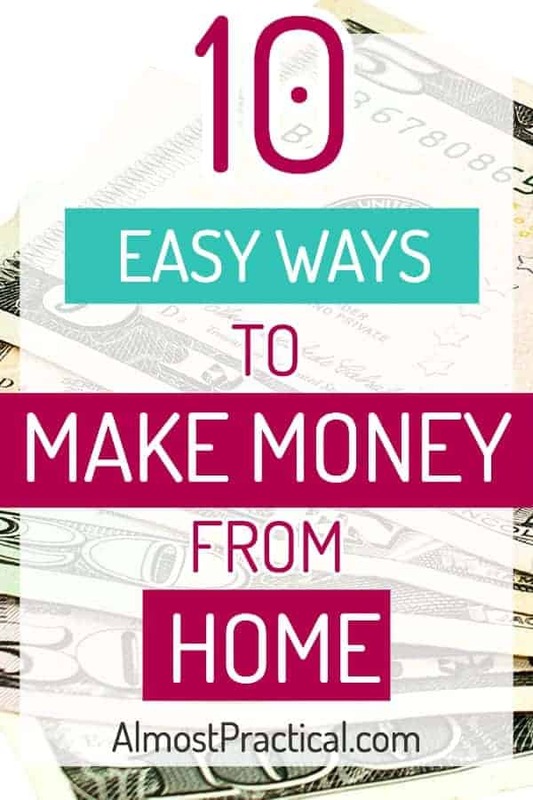 While I listed my top 10 ways to make money from home here – there are so many more ways to make extra cash. You can sell your stuff on sites like Craigslist and EBay. If you DIY then you can make money on Etsy. The sky is the limit. You just need to be creative, confident in your abilities and be willing to work hard. After all, you can't make money doing nothing. Evaluate your own strengths, BELIEVE in yourself, and then go out there and let potential employers or clients know that you exist. What Are Your Favorite Work From Home Jobs? What side jobs have you done to make money from home? What was your favorite gig and why? Let us know in the comments below. Pin this article to your favorite board on Pinterest to refer to later. Don't forget to Download Your Copy! My name is Neena Nandagopal. I'm a CPA turned professional blogger, a mom to four great teens and young adults, and wife to a wonderfully supportive husband. I blog about practical solutions to make life easier - because, well - it is always a work in progress. Hi – I’m Neena. Find awesome ideas for leading a more organized and efficient life. This site contains affiliate links which means that if you click a link in this article and purchase something, I may make a small commission at NO cost to you. Click HERE to see our Disclosure Policy. Almost Practical LLC is a participant in the Amazon Services LLC Associates Program, an affiliate advertising program designed to provide a means for sites to earn advertising fees by advertising and linking to Amazon.com. Amazon and the Amazon logo are trademarks of Amazon.com, Inc. or its affiliates.